This statue is 98,3 cm long and made of pine, with inlayed eyes. The head is made extra and could be taken off, in case there was a fire or calamity in the temple. 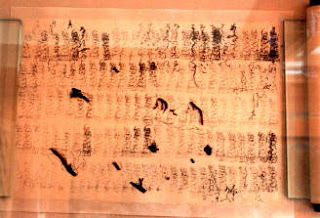 Inside the body was a hollow with many inscriptions and sutras. There were also papers with names of families who had lived in the area around 1350. Legend has it the statue was carried so far by a priest from North Japan, who stayed at the temple over night. When he left next morning, the statue was too heavy for him to carry on, so he just left it in the temple and went away (inuki). Inside the statue was a wooden tablet with a pagoda from the year 1186. 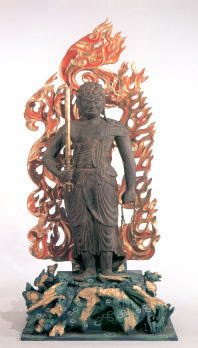 The statue was made by Unkei, ordered by Hojo Tokimasa.